Find out how you could give a child a great start in life - request your copy below. This guide is not personalised advice. This guide is not personalised advice. Please remember tax rules can change and the value of the tax benefits will depend on your circumstances. The value of investments can fall as well as rise so you could get back less than you invest. Before transferring ensure you won't incur excessive exit fees and your child will benefit. If you are unsure of the suitability seek advice. 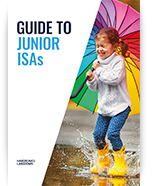 This year you can save and invest up to £4,368 on behalf of a child in a Junior ISA. These tax-efficient accounts are a popular way for family and friends to help a child with the costs they might face later in life. This free guide is not personal advice. Please remember tax rules can change and the value of the tax benefits will depend on your child's circumstances. Unlike cash, investments can fall as well as rise in value and they carry additional risks so your child could get back less than you invest. Before transferring, ensure you won't incur excessive exit fees and that your child will benefit. If you are unsure of the suitability of any investment you should seek advice.